In order to make their film sets conform to the historical periods they are supposed to depict, designers often draw inspiration from actual, historical objects. One of the little joys of being an Anglo-Saxonist is recognising some of the objects you study in the background of your favourite TV series and movies. Here are three examples. The creators of BBC’s The Last Kingdom, set in ninth-century Wessex, have tried to create a set that is as historically accurate as possible (as they will tell you here; though, judging by this clip, where they say they spent a lot of time to find out “what kind of paper” they used in early medieval England, we may need to take this with a grain of salt!). One prop that is particularly interesting is Alfred’s sceptre with the bejeweled cross (see image below), which shows some similarities to the seventh-century whetstone/sceptre found at Sutton Hoo, Suffolk. Like the original Anglo-Saxon object, Alfred’s sceptre has a base with four bearded faces, each facing in a different direction. These four faces on the Sutton Hoo whetstone/sceptre have been associated with a four-faced Slavic deity called ‘Svantovit’, not the sort of thing a pious Christian like Alfred would be comfortable wielding, one might say. The court’s physician Gaius appears to have received some of his medical training from a document from even further ahead in time. On his wall, we can see a diagram that is commonly ascribed to Byrhferth (c. 970-c.1020), an Anglo-Saxon monk of Ramsey Abbey. The diagram reveals how various groups of four (the four elements, the four ages of man, the four wind directions, etc.) all correspond to each other – a visualisation of the harmonious nature of the universe (find out more here). The diagram in Gaius’s room, then, is a nice attempt at bringing in an actual medieval object, albeit about five centuries too soon! When I watched the movie Ivanhoe (1952), I was most impressed by the wall-hanging behind the big table in the house of Cedric the Saxon. This tapestry shows a colouful scene, surrounded by what appear to be runes. On closer inspection it turns out to be one of the scenes depicted on the eighth-century, Anglo-Saxon Franks Casket. This whale bone box, currently in the British Museum, can truly be called multicultural, since it depicts scenes from diverse traditions, including Weland the Smith, the Adoration of the Magi and Romulus and Remus. . The scene so colourfully depicted on the tapestry in Cedric’s house is the Taking of Jerusalem by Titus in the year 70 AD (depicted on the rear panel of the Franks Casket). While the use of colour may strike one as odd, it is assumed that the Anglo-Saxon casket was originally full-colour as well. I wonder whether this particular prop is still lying around somewhere, in some long-forgotten MGM storeroom; if so, I will gladly reserve a place for it on my wall! November 12, 2015 4:30 pm / 6 Comments on Arseling: A Word Coined by Alfred the Great? Throughout the fourth episode of the first series of The Last Kingdom, the Anglo-Saxon warrior Leofric jokingly insults Uhtred by calling him ‘arseling’. 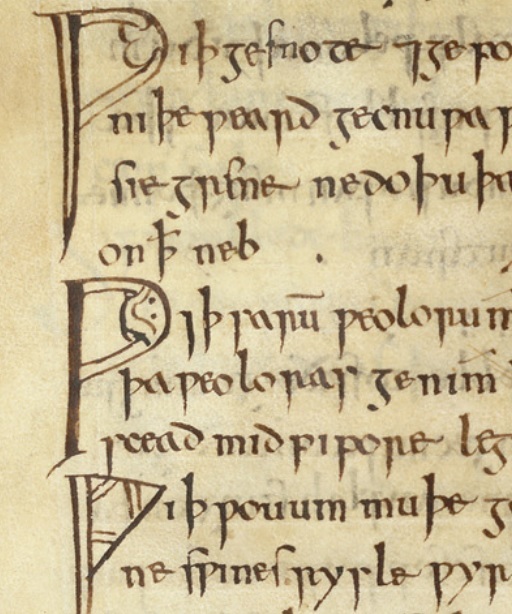 This blog post discusses the origins and use of the word ‘arseling’ in Old English, where it occurs as ‘earsling’. 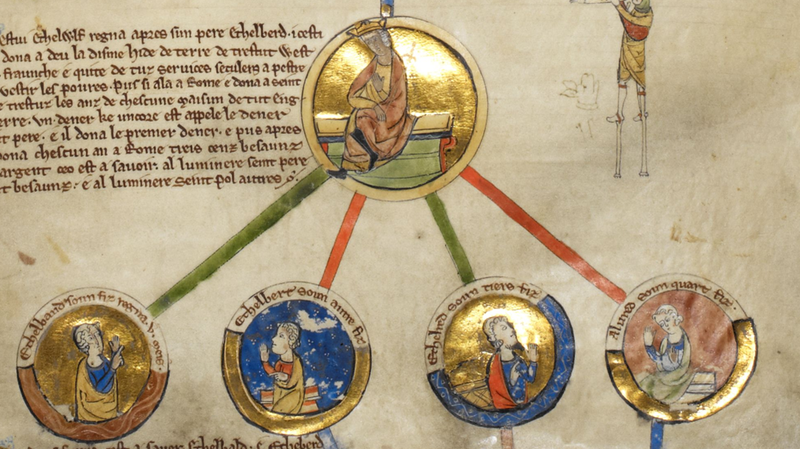 There may be a surprising connection to none other than King Alfred the Great himself! Latin (left): Erubescant et conturbentur omnes inimici mei avestantur retrorsum et cerubescant ualde uelociter. Old English (right): Sceamian heora for ði 7 syn gedrefede ealle mine fynd 7 gan hy on earsling 7 sceamien heora swiðe hrædlice. Translation: Let them be ashamed for this and let all my enemies be driven away and let them go backwards and let them be ashamed very quickly. 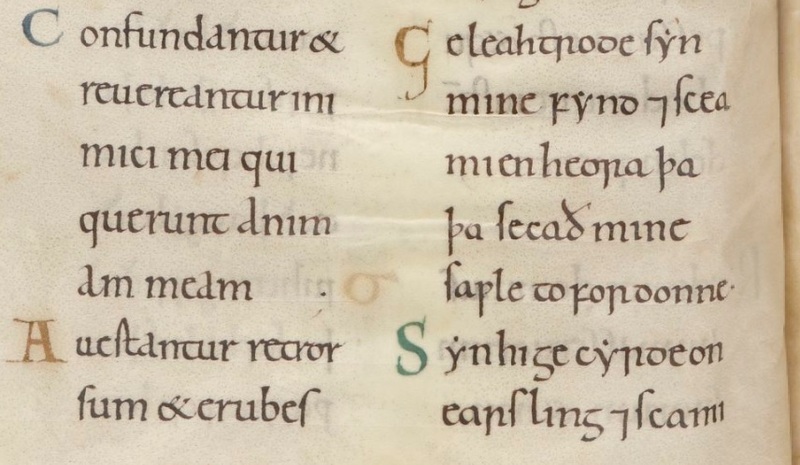 A search in the Dictionary of Old English Corpus (a digital corpus that contains one copy of every extant Old English text) reveals that “earsling” only occurs in these Old English prose Psalm translations; earsling is a so-called hapax legomenon, a word that is restricted to this one text. But who was responsible for this Old English prose translation of the first fifty psalms? The author of earsling: Alfred the Great!?! According to William, Alfred was unable to finish his translation before he died, possibly succumbing to his mysterious disease at the age of fifty (see this blog post). This seems to fit well with the fact that the Early West Saxon prose translations in the Paris Psalter only cover the first fifty Psalms, followed by another (verse) translation of the remaining Psalms. It is no surprise, then, that scholars such as Bately 1982 and O’Neill 2001 attribute the prose Psalm translations of the Paris Psalter to Alfred himself on the basis of a comparison with other translations attributed to the famous king (although their views have not gone unchallenged, see e.g. Treschow, Gill and Schwartz 2009). 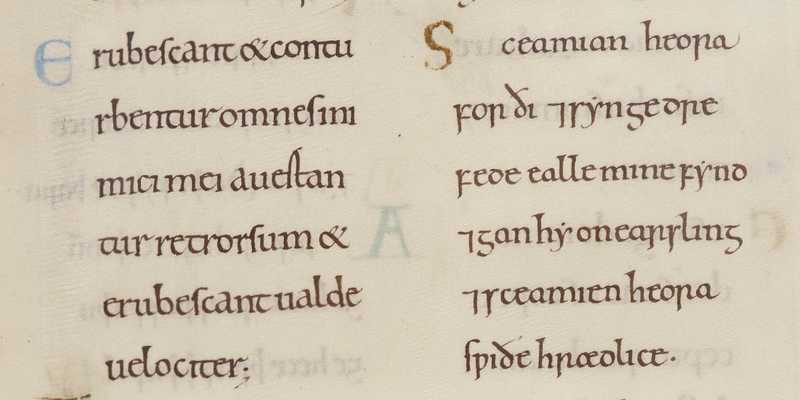 If Alfred was responsible for the prose Psalm translations that survive in the Paris Psalter, does this mean he also coined the word earsling? Probably not, but, for as far as we know, he was the first (and the only) Anglo-Saxon to use the word in writing. 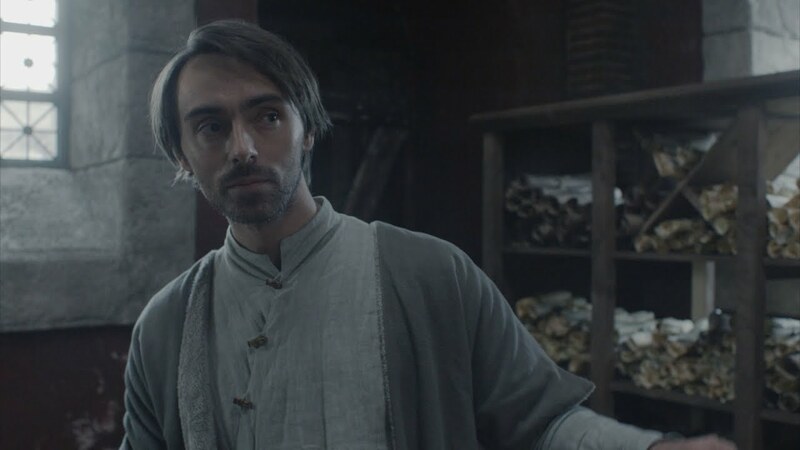 The use of arseling in BBC’s The Last Kingdom, then, fits perfectly within the Alfredian period it attempts to portray – perhaps the historical Alfred himself had been inspired to use the word in his Psalm translation because he overheard the jocular insults such as those made by Leofric among his own warriors! As noted above, Old English earsling was not used in any other Old English text. According to the OED entry for arseling, the word resurfaced in the Scottish poem The Fortunate Shepherdess by Alexander Ross, published in 1768: “Then Lindy to stand up began to try; But—he fell arselins back.” No further use has been recorded by the OED, which, therefore, declares the word “obsolete” – dead. I have no doubt, however, that an updated version of the entry for arseling (the present one dates back to 1885), will report of its revival following the popularity of Bernard Cornwell’s novels and their BBC adaptation. Thus, the series cannot only be credited for reinvigorating an interest in the historical period of Alfred the Great, but may also be responsible for reintroducing some of Alfred’s own vocabulary! Bately, Janet. 1982. Lexical evidence for the authorship of the prose Psalms in the Paris Psalter. Anglo-Saxon England 10: 69-95. Treschow, Michael, Paramjit Gill and Tim B. Schwartz. 2009. King Alfred’s Scholarly Writings and the Authorship of the First Fifty Prose Psalms. Heroic Age 12. October 29, 2015 9:43 pm / 5 Comments on Passion, Piles and a Pebble: What Ailed Alfred the Great? The second episode of The Last Kingdom (UK airdate: Thursday, 29 October, 9 pm, BBC 2) introduces Prince Alfred, who would later become King Alfred the Great (d. 899). In his first scene, Alfred is portrayed as a man tormented both physically (because of his health) and morally (because of his lustful feelings towards the flustered maidservant that had just left his room). This blog post highlights some sources related to the historical Alfred and explores what they reveal about his passions…and his piles. Known as one of the greatest monarchs of Anglo-Saxon history, defeater of the Danes and instigator of an important educational reform, Alfred was, in fact, an unlikely candidate for the throne of Wessex. For one, he was the youngest son of King Æthelwulf of Wessex (reign 839-858), which means he had four older brothers: Æthelstan (d. 852), Æthelred (King of Wessex, 858-860), Æthelbald (King of Wessex, 860-865) and Æthelberht (King of Wessex, 865-871). Only after all his brothers had died, Alfred (apparently, Æthelwulf had run out of Æthel-names…) became eligible to rule. Given that he was the youngest of five, Alfred was probably groomed for an ecclesiastical career (his father took him to see the pope, twice), which may explain his interests in learning in his later life. Another reason why Alfred may have been considered an unlikely king at the time was because he suffered from a terrible illness, as is revealed by a biography written during his life by Bishop Asser in the year 893. 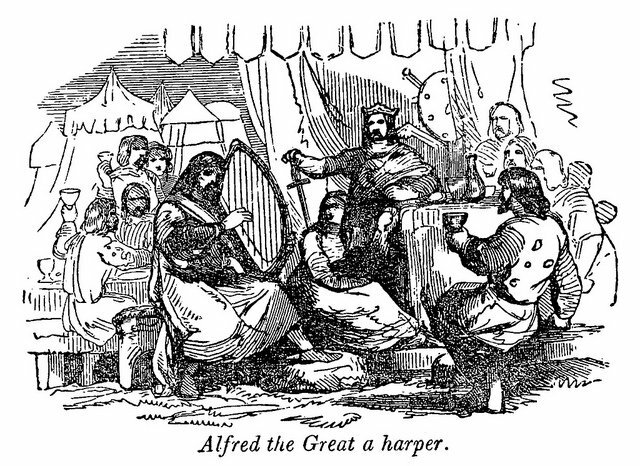 Asser’s Life of King Alfred is a unique source on Alfred’s life and character, written by one of his own courtiers. Asser not only records Alfred’s battles with the Vikings and his dealings at court, he also reports some of Alfred’s medical details, mentioning that, from his youth, Alfred had suffered from “ficus” [piles, haemeroids]. In other words, young Alfred, afraid of his own dirty thoughts, asked God to grant him a distraction and God gave him haemeroids! While the disease may have been unknown to the Anglo-Saxon physicians, modern-day scholars have used Asser’s description to diagnose Alfred with Crohn’s disease (Craig 1991). This diagnosis is corroborated by another document made during Alfred’s lifetime: Bald’s Leechbook. Bald’s Leechbook is a compilation of various medical texts, which was possibly made at Alfred’s own request. Within this compilation, there is a section that is concluded by “þis eal het þus secgan ælfrede cyninge domine helias patriarcha on gerusalem” [Elias, the patriarch of Jerusalem (c. 879-907), ordered all of this to be told to King Alfred]. Included in this section are remedies for the alleviation of constipation, diarrhoea, pain in the spleen and internal tenderness, which all fit well with the pathology of Crohn’s disease(Craig 1991, p. 304). The Old English text also records that Elias sent him a “hwita stan” [a white stone], which could be used against all sorts of illnesses; as an added bonus, the white stone would also protect the owner from lightning and thunders (the text is edited by Cockayne 1864, Vol. II, pp. 288-291). To make a long story short: Alfred was a passionate boy, God gave him piles and the patriarch of Jerusalem gave him a pebble. Poor Alfred. Craig, G., ‘Alfred the Great: A Diagnosis’, Journal of the Royal Society of Medicine 84 (1991), 303-305.